Moody's downgraded Turkey's rating by one notch on Friday to the speculative or "junk" level of "Ba1" because of the country's political turmoil and unpredictability. Downgrades by major rating agencies typically translate into higher borrowing costs for a government. The country has suffered a series of attacks by Kurdish militants and Islamic State group jihadists this year as well as the attempted coup in July by a rogue military faction which tried to oust Erdogan from power. The president said the economy continued to strengthen and see investments, dismissing the downgrade's impact and telling the agency: "Drop Turkey's rating however much you want." He appeared to suggest that the ratings agency was corrupt during a televised speech in Ankara to Turkish neighbourhood heads in charge of local administration. "Put three-five cents extra money in their pockets and get the rating you want. This is how they work. We know where they get their instructions, we will always speak the truth," he said, without indicating who was giving instructions. 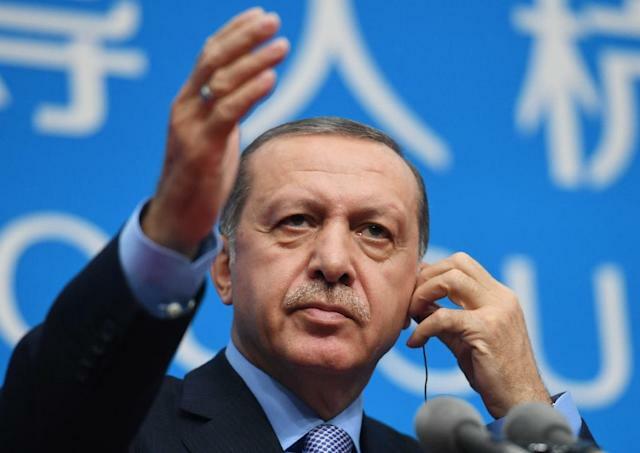 At one point during his speech, when he suggested Turkey could even need to be in a state of emergency for a year, the Turkish lira reached three against the dollar. It soon recovered again to 2.9 lira against the greenback. Prime Minister Binali Yildirim hit out at the ratings downgrade as a "biased" act at the weekend while Deputy Prime Minister Numan Kurtulmus said it was a "political" decision on Monday. Erdogan's remarks were in stark contrast to his Deputy Prime Minister in charge of economic affairs Mehmet Simsek who said earlier in the day that Turkey took the rating downgrade seriously and that Moody's "did not act hastily". Simsek said: "It's not trivial but it's not the end of the world," adding that the downgrade was not prompted by the attempted putsch. Simsek, a former finance minister, told the official news agency Anadolu during a televised interview that Turkey needed to implement structural reforms rapidly. "Instead of an emotional response, Turkey will try to solve the structural problems. If we implement structural reforms within one or two years, the outlook will turn positive and ratings will start to rise."